Running a 10 light load is a tough job! 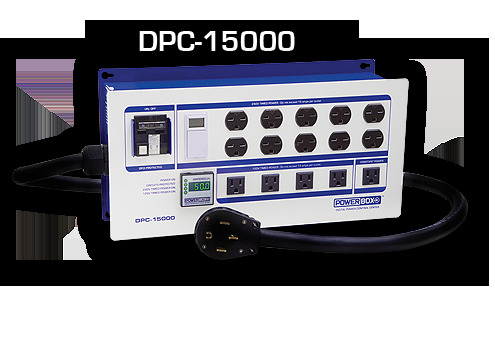 Luckily, the DPC-15000 is up to the task. This unit is capable of running up to ten 1,000 watt lights, plus 120-volt accessories - safely and reliably - year after year. 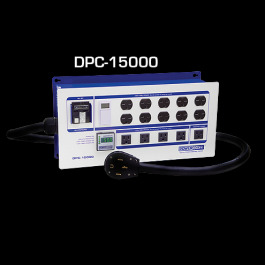 The DPC-15000 is top-quality from the inside, out - every component is selected based on safety, durability and reliability. Rest well knowing knowing that you are protected against fire and electrocution with our microprocessor-controlled GFCI main circuit breaker, which senses dangerous line conditions and reacts immediately to protect you from danger. Don't trust anything less - an investment in a Powerbox™ Lighting Controller is worth every penny! ETL Listed for approved use in the United States and Canada. GFCI main circuit breaker provides the ultimate in safety and protection for you and your environment - 50A or 60A main capacity. Heavy-duty contactor relay to control load switching. Built-in AUBE digital timer with battery backup. Ten timed 240-volt outlets (6-15r) and five 120-volt outlets (5-15r). Digital ammeter shows exact current draw in real-time. Detachable trigger cord can override the built-in timer, so Powerbox™ can be controlled by other devices. Durable powder coated seamless steel enclosure. All components mounted from the inside for smooth outer surfaces and tight seals to keep out moisture. Plug & play (14-50P) or hardwire - Keyhole tabs for easy mounting. Hand-built at our California factory - 5 year warranty - Legendary Powerbox™ Quality.